Run QZ Tray as a dedicated service, useful for machines that cannot have QZ Tray installed (such as a Terminal Services/Citrix environment and mobile/sandboxed devices such as iOS, Android, ChromeOS). The steps will be the same for each platform, however, the way you regenerate the certificate and install it on the client will vary. Install QZ Tray 1.9.5 or higher onto the server via the desktop installer. Refer to this guide if unsure how to do this. By default, the deployQZ(); and qz.websocket.connect(); functions are bound to localhost. This can be overridden. Note:foo.bar is the hostname of the server. That's it! At this point, an HTTP connection can be made from a client to the server running QZ Tray. The steps below illustrate how to establish an HTTPS connection. HTTPS: The steps provided in this section illustrate how to create a certificate for a secure (HTTPS) connection. These steps are not needed for connections made via HTTP. Important: Organizations wishing to use a Trusted CA SSL certificate can do so by manually shimming it into the software. The rest of this section can be skipped. For secure websockets support (HTTPS), QZ Tray generates a certificate for localhost traffic at install time called root-ca.crt. In order for QZ Tray to run on a separate machine, the hostname (usually "localhost") must exist in the certificate. This is an override which is done by running a custom script. 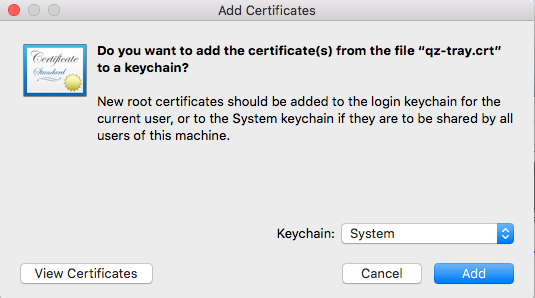 Re-run the certificate generation ("foo.bar" is the hostname that QZ Tray will run on). If you require Firefox HTTPS support, Firefox needs to be installed prior to this step. 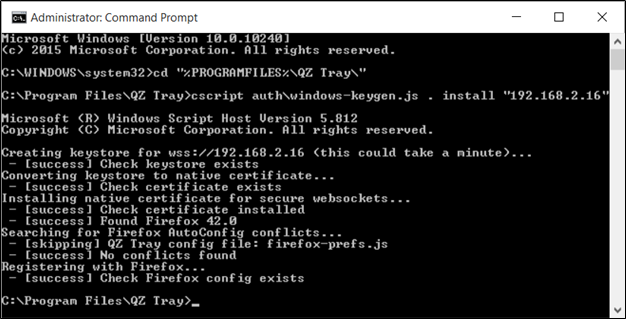 cscript auth\windows-keygen.js . install "foo.bar"
sudo bash qz-tray-1.9.x.run -- -y "foo.bar"
sudo /Applications/QZ\ Tray.app/auth/apple-keygen.sh install "foo.bar"
sudo /Applications/QZ\ Tray.app/auth/firefox/firefox-cert.sh install "foo.bar"
Restart QZ Tray. 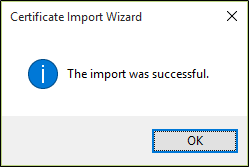 This must be done every time you regenerate a certificate. Optional: Copy the demo folder for testing (located in QZ Tray\demo) from QZ Tray to the client. Note: If unsure of the location of these files on your system install QZ Tray on a test system and search for them by name. They are both created by QZ Tray and can safely be overwritten. Certificate installation varies between browsers and platforms. Distributing a certificate marked for a custom hostname is a manual process which much be done on all workstations requiring HTTPS + QZ Tray. From KeyChain set certificate to "Always Trust"
Under the SSL section, click the "Download certificate" with the alias of the newly created certificate. If you are not running QZ Tray 2.0.9 +, you will need to host the root-ca.crt somewhere so you can download it from the web (e.g. temporarily on a webpage, Google drive, etc.). The about page will not have the certificate to download. Use Safari to download the root-ca.crt. 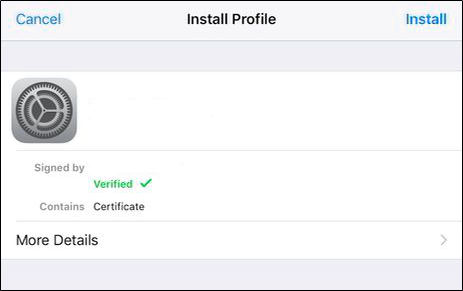 Safari will automatically prompt the installation of the certificate. Chrome and other browsers will not. When Prompted, select "Allow"
The profile installer screen should automatically appear. Select "Install"
Firefox does not allow self-signed certificates to be imported directly, instead a manual import process is needed. Overlay the existing Firefox files with the ones transferred over from the server. Note: If HTTPS still fails, or you are experiencing long timeouts before a connection is made, a firewall may be blocking the connection. Try disabling the firewall, or allowing the port on the server.